Neon Staxx is a slot by NetEnt with five reels and forty paylines. Symbols of the slot consist of regular pictures and symbols with advanced features. As a bonus option, the slot offers a round of free spins. The Super Staxx function helps to create numerous combinations. As experienced players claim, forming of two to five combinations for a spin is common, thanks to the Super Staxx feature. It can be activated at any spin. As a result, one or more symbols of the slot turn into multi-layered pictures. They take up a row of consecutive boxes and can fill the entire reel. This feature significantly increases your chances to form combinations. The bonus option in the Neon Staxx online slot powered by NetEnt is a round of free spins with advanced features. To open up free spins, you need to collect 3 to 5 Scatter symbols. The duration of the free spin round depends on the number of pictures that have launched it: 3 symbols gives you 10 spins, 4 symbols gives you 15 spins and 5 will launch 20 free spins. The landing of the Scatter combination during the bonus game extends the duration of the round accordingly. Before launching the spins, the slot randomly selects one of the pictures. This symbol will take up several boxes in the column. So, it is possible to fill all twenty boxes of the game window with identical pictures. Experienced players note the high return to player of the slot and a good frequency of creating combinations. According to the information, declared by the developer, for long distances the slot gives back 96.9% of all bets. If you are looking for a little more thrill having tried out the free play demo at NeonSlots, you may like to find more online slot machines to play for free. Other symbols create combinations following standard rules. To earn a payout, you need to collect at least three identical pictures on an active payline. Winning pictures must land in the boxes of neighbouring reels, starting with the first one. If several combinations land at once, the winnings will be added up. 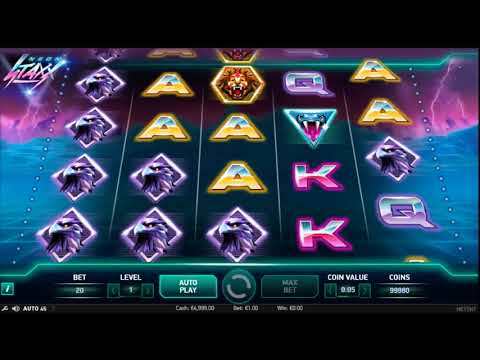 Discover more free to play Neon games at neonslots.com. The total bet is automatically calculated and displayed in the Bet section. The user settings are found at the bottom of the gamescreen. The slot enables you to adjust sound, speed and other options. The 'i' button opens up the pay table on the screen.